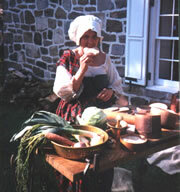 We've added something new - The Foodways of the 1606-07 Voyage to Jamestown! on programs, or for additional programs not listed here. There were 105 men and boys and 39 sailors that embarked on the Susan Constant, Godspeed and Discoverie for the over four month voyage to Jamestown. This interactive power point presentation with display sheds light on the ships provisions, daily meals and the challenge of avoiding nutritional crisis at sea. Nelly Parke Custis Lewis, step-granddaughter of George Washington wrote detailed descriptions of George’s typical breakfast and the manner in which it was prepared. This hands-on, interactive program replicates the process at the hearth while teaching about the Washington family, the seasonality of foods, and the equipage and presentation of the meal. An opportunity to expand the hands-on aspect of this program is available with use of a quern for grinding the corn flour. From harvesting ice to moulding of ice cream, this demonstration involves the production of ice cream in a reproduction 18th century sabotiere. Only documented 18th century flavors are reproduced using original receipts (recipes). Hearth or fire not required. Hands-on activities for children can be incorporated. 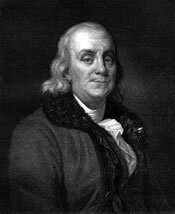 "Food not costly vain, but plentifully good." An 18th century foodways program based on receipts in the Benjamin Franklin papers and quotes from Poor Richard's Almanack. This program can be done with or without fire pit or hearth. From cacao bean to chocolate, this demonstration can be simply the use of the metate to process chocolate nibs to pure chocolate, or the entire process from roasting raw cacao beans to the chocolate product. 17th and 18th century chocolate receipts may be demonstrated if desired. Hearth is not required for the demonstration of the metate. The story of gingerbread is a fascinating story as it evolves from a mixture of ginger and breadcrumbs to its present day form. This program provides actual product made from original receipts to tell the history. If hearth is available, an appropriate receipt of gingerbread can be prepared as part of the program. The cheese making process is demonstrated with rennet and raw milk and shows the preparation of both soft and hard cheeses. 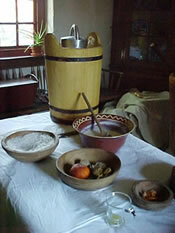 Actual demonstration is available only during the months that milk was available in the 18th century. Presentations, showing all aspects of the cheese making process, are available year round. Hearth is necessary for actual cheese production. The history of American Shad from either the Colonial or the Native American Perspective. Fire not required. This is an excellent presentation for Celtic festivals. 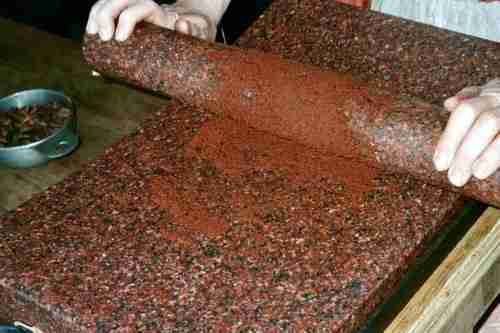 Typical Scottish foods are prepared using a girdle, bakstone, and spurtle while the smell of peat is in the air. This presentation is based for fire pits outdoors or hearth. Presentation is possible without actual cooking. Hands on activities for children are included. Preservation techniques demonstrated. Fire is not required. 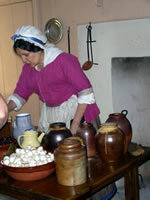 What was the food like on shipboard in the 18th century? This presentation focuses on demonstrating the typical shipboard fare of both American and English vessels. The use of braziers is available for actual production of foods but the presentation can be done without. Hands on activities for children can be incorporated. 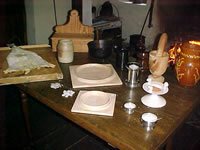 Typical Tavern fare demonstrated. Several topics available, from food to drink. Everything hath an end and a Pudding has Two.. The history and evolution of the English pudding provided with original receipts. This program can be presented with or without hearth. With hearth or fire pit capabilities, actual receipts and processes can be demonstrated. 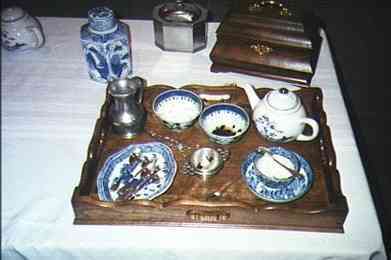 The etiquette and meaning of taking tea in the 18th century is explored with reproductions and artifacts. Each piece of equipage is demonstrated and discussed as well as the differences in the basic types of tea. Tea is just one of many 18th century beverages and with each beverage came the proper drinking vessel. This presentation shows with reproductions and basic ingredients, many of the beverages commonly used—tea, coffee, chocolate, ale, beer, punch, posset and several others. This program can be presented with samples of some of the beverages. Salt is the one rock that humans need and consume.  It is such a basic substance in our lives that it is rarely given much thought. Salt has a fascinating history and story. This presentation tells the story with different samples of salts and reproduction artifacts. Native American demonstrations that focus on the foodways of the Eastern Woodland Indian (which include Lenape, Iroquois, Wampanoag, Penobscot and others) are available with fire or without. Presentations can be done either outdoors or indoors. The actual presentation depends on the season of the year. Actual foods can be produced and demonstrated or it can be a static display. Other programs are available on request. Please contact Susan if you have any questions or need more information. Images and text copyright 2003-2016 Susan McLellan Plaisted.